An in-depth government report “prepared by and for the military” and obtained by a Nevada newsroom, details a 2004 incident involving an alleged “UFO” sighting recorded by the US military off California’s coast 14 years ago. Dubbed the “Tic Tac” incident, the unidentified flying object “rendezvouses” with a huge underwater object. So named for the white, fast-moving, mint-shaped object that was involved, the video’s release made waves last year when it was first revealed by the New York Times. Over the course of two weeks in 2004, a 13.7-meter-long (45-foot-long) Anomalous Aerial Vehicle (AAV) defined as “aerodynamic” with “no visible means to generate lift” was detected by US naval ships in short glimpses. According to IFLScience, based on the recently leaked report, the undated document suggests there may have been something in the water as well. F-18 aircraft were called into the area after the USS Princeton wasn’t able to lock on to the AAV (Anomalous Ariel Vehicle.) The report details the moment a pilot noticed a disturbance under the surface of the water resembling a “barely submerged reef or island”. 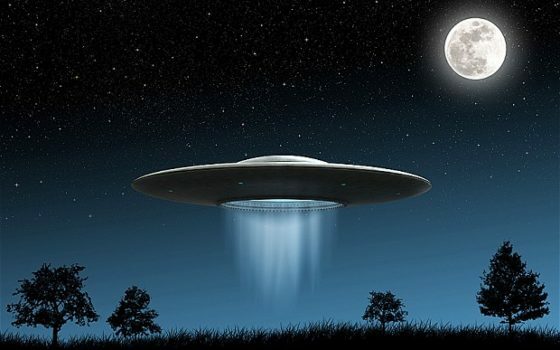 As the pilot flew away, the object reportedly disturbed the water underneath it in “frothy waves and foam” resembling water that was “boiling.” The unidentified flying “Tic Tac” object was potentially rendezvousing with the massive underwater one, according to the report. Earlier this year, the Department of Defense released three separate videos showing an encounter between a Navy fighter jet and an unknown object. For years, the department’s Advanced Aerospace Threat Identification Program was kept secret until last year when the Pentagon announced its then-defunct program never gained evidence of alien life visiting Earth.